Every season of the year, the Seto Inland Sea presents us with the beauty of more than 700 islands, large and small. These islands seem to move with the tide, sometimes so close you can reach out and touch them, then floating away into the distance across the sea. Moving gently at walking pace, sea kayakers wind between these islands, experiencing their beauty with all five senses. With the tide in the Seto Inland Sea ebbing and flowing by more than three meters, they choose the route of their journey by the conditions of the sea. Reading the waves and the wind, their journey befriends them with nature. The sea kayak, allowing them to get so close to nature and being so easy to use, is the perfect way to explore the Seto Inland Sea. Additionally, the Seto Inland Sea having long been an important route both for the navy and for trade with the Korean peninsula, they feel a sense of history and heritage wherever they go. Sensing the paths of their ancestors, and enjoying this very real experience, adds to the charm of their journey. Sea kayaking began in the area during the Eighties, and the pastime presently continues to grow, with more and more centers and suppliers becoming established. Current popular sites for sea kayaking include Shodoshima, Ushimado, Shimanami Kaido area, and Miyajima, as well as all around Hiroshima bay, Oshima Island and Shimonoseki in Yamaguchi prefecture. Tours and events are held which range from local neighborhood areas to the rugged beauty of the wilderness. Enjoying a mild climate all year round, the Seto Inland Sea allows us to enjoy the charm of sea kayaking more than any other area. Open all year, with courses from beginners, to tailor-made tours designed to your specifications. Regular skill-improvement courses, equipment rental available. Area: Tokushima (Shikoku), Shodoshima, Naoshima. Based in Shodoshima, offers beginners and improvement courses. Tours can be tailored made to your requirements, such as pilgrimage tours. Also offers several Ecotours and overseas tours throughout the year. 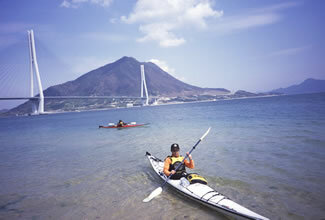 A sea kayak center operated from a Japanese style Minshuku on Shiraishi Island, offering accommodation and kayaking. Also offers experience in beach seining, windsurfing and diving. 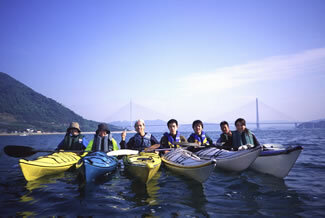 Open all year, offering monthly camping tours to experience the nature of the Seto Inland Sea. Tours and courses designed to your specifications, beginners courses offered as required, equipment rental available. Area: Onomichi, Tomonoura, Shimanami Kaido. Weekly tours, beginners courses, improvement courses, rental available. Tours can be designed according to your specifications. Offers private and regular tours, beginners courses, and equipment rental. Also runs camping and day tours.